A "flying" museum, like the Cold War Air Museum must exercise their aircraft, or at least the engines and systems on a regular basis. Saturday was a work day for our many volunteers and supporters. A number of aircraft were brought out for engine start and exercise. 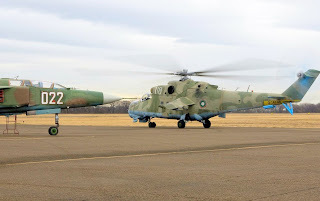 The Mi-2's and Mi-24 are run up on a regular basis. 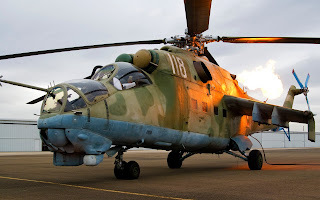 Starting the Mi-24 can be exciting. The aptly named Saphir APU has a tendency to blow out any excess fuel during its start cycle. The sight and sound is impressive. Once again, our thanks go to Miguel for this outstanding picture. This picture and a number of others can be found as a desktop display on the "wallpapers" page at the museum main web site. Fuel sales for the "big iron" help support the airport. Visitors commented that it felt like they were on a Soviet air base. For a short time Saturday, that feeling was understandable. The MiG-23 is still undergoing restoration while the L-39's at the museum fly regularly. With local and world-wide coverage from our web sites, we often gain new associates. One of our new associates is a former Russian pilot and MiG-23 instructor who is currently employed at a major flight training center at DFW. He is a big help with systems knowledge and practical experience in the MiG-23. 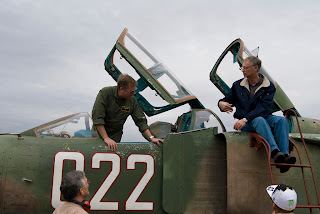 Vadim and Jon debrief their MiG-23 taxi test. The MiG-23 looks like it's going supersonic, just standing still. The massive R27-F2M engine in the MiG-23 makes a wonderful, unmistakable howl as the power comes on. No Mud Today! Just lots of happy noise from turbines turning and burning, consuming Jet-A. Amazing! Can't wait to see the '23 airborne....do you guys have a set flight schedule for your 'birds?